Located in the heart of California's Orange County, Santa Ana is the fourth-densest large city in the U.S. It is a gathering place for artists, entrepreneurs, and central to Orange County’s creative class. 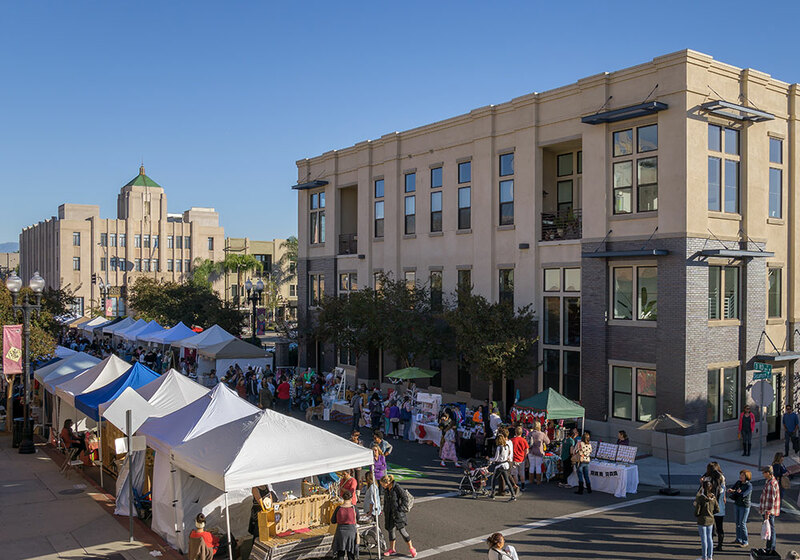 Downtown Santa Ana’s booming local businesses, restaurants, and long-time residents are committed to the creation of a tight-knit, thriving community that celebrates diversity through festivals and public celebrations. View of the downtown skyline and the weekly farmers' market. Photo by Lisandro Orozco. The neighborhood is bounded to the north by Civic Center Drive, on the west by Flower Street, to the south by First Street, and on the east by the Southern Pacific Railroad. Summer street scene in front of 4th Street Market. Photo by Lisandro Orozco. Downtown Santa Ana has evolved organically over the past 147 years with the support of key municipal investments. The area has a great mixture of land uses, ranging from government buildings to shops and offices, all the way to a small industrial sector in the east. Downtown Santa Ana’s architecture is a unique blend of Beaux Art, Classic and Spanish Revival, Victorian, Craftsman, Brutalism, California Contemporary, and a dash of Art Deco that makes each walk an experience. By the 1970s, Santa Ana policy makers were advocates for the reinvestment and active preservation of the downtown’s historic architectural heritage. They worked with local preservationists and community members to identify key landmarks, establish two historic districts, and provide interest-free loans to seismically retrofit structures. The City of Santa Ana also developed a close partnership with Orange County to establish the Downtown Civic Center as the major engine of the local economy by providing a central hub for federal, state, and local government activities. The Civic Center is now undergoing a 20-year improvement project to reinvest in 16 county-owned and leased buildings in the downtown area. 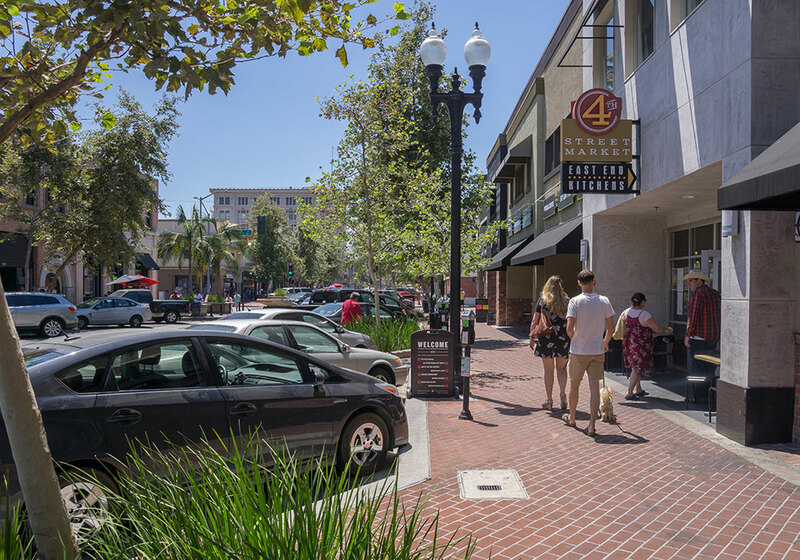 With a goal of further nurturing the growth of downtown Santa Ana into the future, an award-winning Transit Zoning Code was implemented within the neighborhood. It is currently the largest form-based code in the U.S. The plan has facilitated the design and construction of more than 170 affordable housing units, and a recently adopted adaptive reuse ordinance will facilitate the conversion of unused office and industrial space into residential units. The Santa Ana Regional Transportation Center (SARTC) connects downtown to the rest of the region with service from Amtrak, Metrolink, and a variety of regional bus agencies. New Start funds and matches from the Orange County Transportation Agency (OCTA) will be used to develop a streetcar system that will connect the Civic Center to SARTC along the old Pacific Electric Red Car route. Construction begins in 2017. Finally, the Downtown Complete Streets Plan, which includes pedestrian and bicycle infrastructure, will soon be implemented, promoting and ultimately creating a healthier Downtown Santa Ana. Community engagement has been at the core of downtown’s diverse community, composed of residents (including seniors), commercial and retail business owners, merchants, real estate investors, artists, and members of community- and faith-based organizations. These groups share a history of championing neighborhood vitality, livability, and investment. 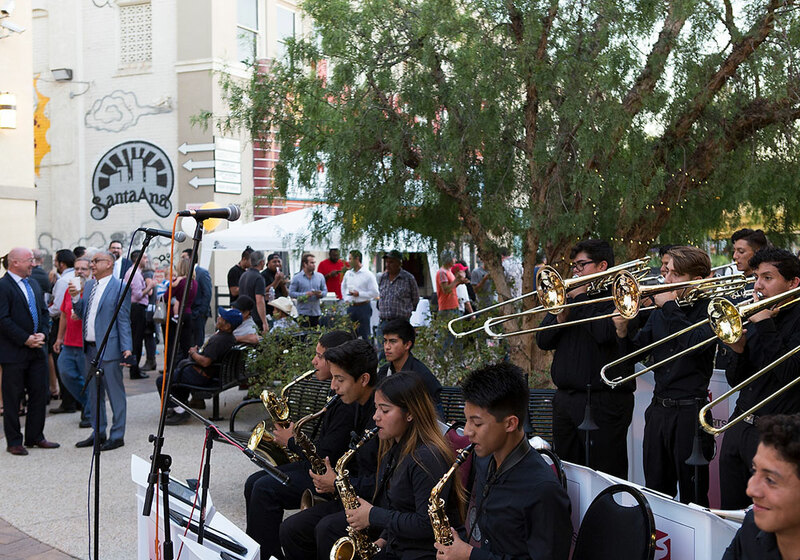 Working together with local bar owners, restaurateurs, and land owners, the local community groups program a growing number of events on streets and public spaces, giving area residents a chance to experience Santa Ana and sample its award-winning food. The culture and flair of Downtown Santa Ana offers a distinctive experience in Southern California. The neighborhood is filled with eclectic restaurants, one-of-a-kind retail shops, independent breweries, weekly pop-up markets, community-driven chef incubator spaces, creative office space, live-work housing, government offices, art studios, North America’s first E-sport Arena, Orange County’s only independent art house cinema, and a university-run art residency complex hosting internationally renowned and emerging local artists. Outdoor events, like the Patchwork Show, occur throughout downtown Santa Ana on a monthly basis. Photo by Lisandro Orozco. Downtown Santa Ana has a tradition of hosting a variety of uses throughout the neighborhood's 147-year history. There are multiuse buildings and dense urban developments, including government buildings, industrial, commercial, and residential. Downtown Santa Ana is on the National Register of Historic Places. In a sea of Orange County tract housing, the neighborhood has a unique urban identity that is hard to find in Southern California. There are 99 historic structures that date from 1870 to the post-earthquake reconstructions of 1934. Adjacent residential areas are safe, family-friendly, and close to shops, restaurants, and offices. Downtown Santa Ana is a Walker’s Paradise, according to WalkScore.com. The City of Santa Ana's annual Cinco de Mayo festival, celebrating the city’s Mexican culture, is attended by over 150,000 people. The Fiestas Patrias Parade, celebrating Mexican Independence Day, attracts more than 200,000 attendees. The East End Blading Cup has become an international event that attracts thousands of people from across the world to compete in a skating competition on Fourth Street. 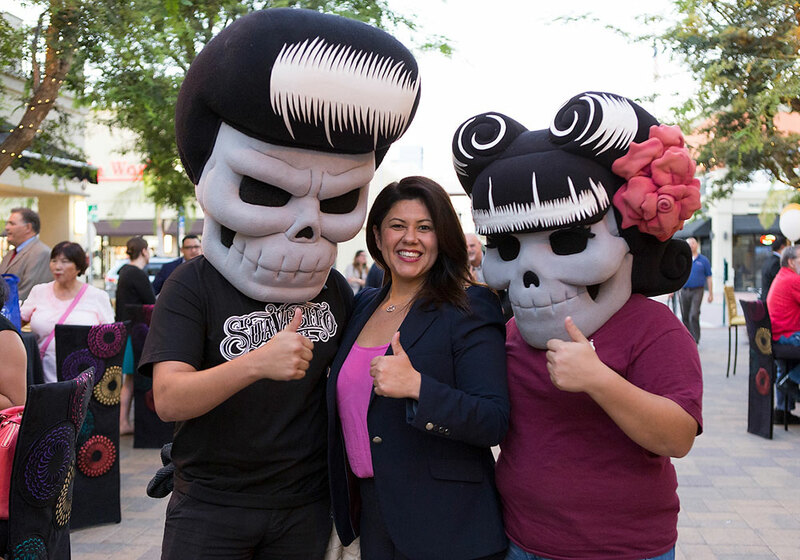 The Noche de Alatres brings together nonprofits, families, and tourists to the downtown for one of America’s largest celebration of Día de Los Muertos (Day of the Dead) and attracts visitors from all over the region. The fall and spring Patchwork Show puts on display of local emerging artists, crafters, and designers alongside artisan food, DIY craft workshops, gourmet food trucks and indie music. 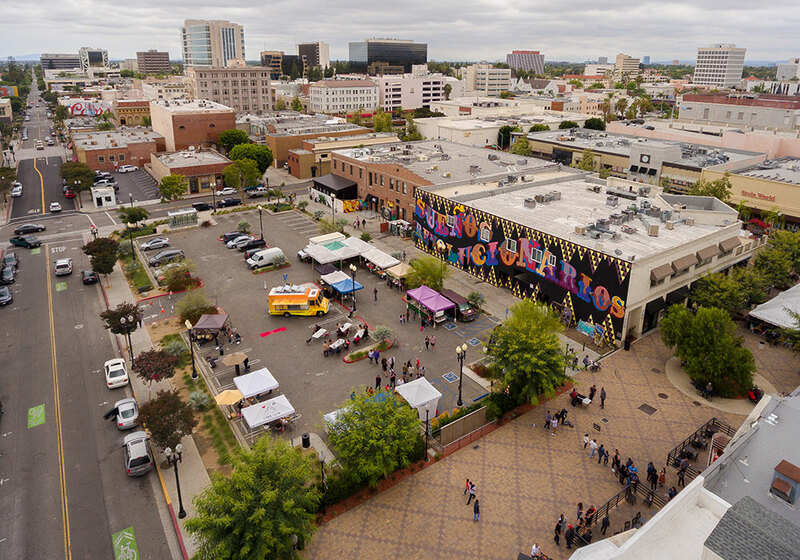 A monthly Art Walk (first Saturday of every month) showcases the thriving arts and culture in Downtown Santa Ana and a second Art Walk at the Santiago Lofts is held the third Saturday of every month. The neighborhood hosts Orange County’s largest Pride event every summer. East End Block Party features multiple outdoor music stages, a vinyl swap meet, and car show. A historic Street Breakfast that dates back to the 1920s was recently reinstituted, serving pancakes and chilaquiles to over 1,000 Santa Ana residents. Viva-la-Vida (Celebration of Life) at the SARTC celebrates the evolving culture emerging out of the 21st century Southern California experience. Kicking off the Downtown Santa Ana event. Photo by Brian Feinzimer. Creative costumes at the Downtown Santa Ana event. Photo by Brian Feinzimer. 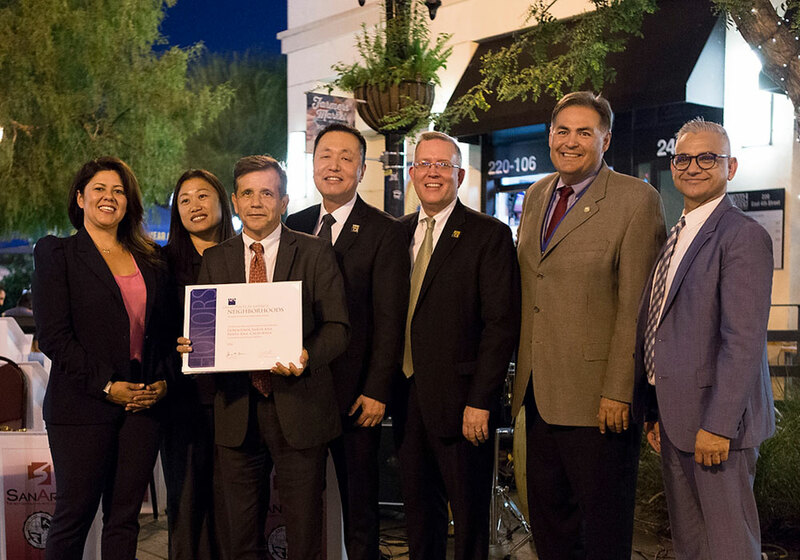 Downtown Santa Ana and APA California Chapter leadership holding up Downtown Santa Ana's Great Neighborhoods certificate. Photo by Brian Feinzimer.